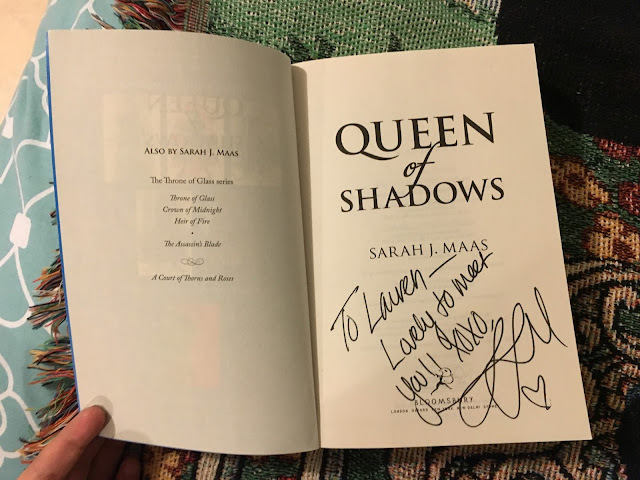 About a month ago, while scrolling through Instagram, I saw Sarah J Maas mention something about an Australian/New Zealand tour and practically threw my phone in the air. Within 24 hours I had booked a ticket for myself and my Mum (who is a big lover of fantasy and is also currently reading Maas' books) to head into Auckland City and meet the amazing author. I've always read and heard that you shouldn't meet your idols, or people you adore, in real life because they're never what you expect them to be. 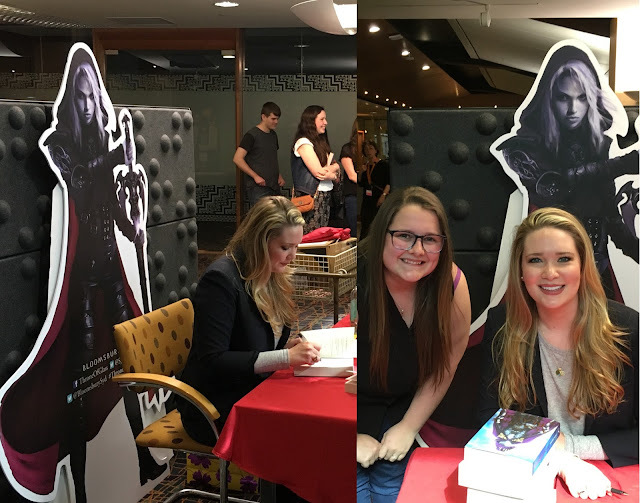 Well, let me tell you, Sarah J Maas is a total fangirl. From the beginning of her talk, she babbled about how she'd spend the next two weeks of her visit to New Zealand exploring all the filming locations for the Lord of the Rings films (and let us know that as a teenager she had a cardboard cut out of Legolas in her room that had a shiny mouth because of the amount that her and her friends would make out with it, I have never laughed so hard! ), and told us she'd had her merchandise packed before any clothing. She was super funny, and swore like a sailor (don't worry, she checked that it was okay with us first, haha!) and told us about her love of Gilmore Girls, being a fangirl, and a bit about her experience with writing and the influence of social media, which was really interesting. The interviewer, from Time Out Bookstores, asked her heaps of (slightly awkward and odd?) questions, asking which films she watched on the plane and such. However, she asked how much Maas felt that LoTR had influenced her writing and I wished I'd have written down the answer, but basically she said that LoTR made her fall in love with the epic quest story line, but that it also challenged her to break the rules, because she's not able to do some things with her writing (such as calling a place 'the ___ Shire', which would fit her story) and other things. Maas ensured us that she's a reader first, and a writer second. Something really exciting that she mentioned was that, although book five is in it's early stages of production, at the moment it follows that kind of epic quest story line that she loves so much. Very exciting! After the talk we were pretty much herded into the room where the signing was to take place in batches, and unfortunately the set of seats I was sitting in was last to go through. Luckily for me, I met some pretty awesome book-loving kiwi's in the line, who made the wait fly by. It was so nice to chat about books with people who were right in front of me. Now, onto the embarrassment. In my head I had planned to tell Sarah J Maas (it feels weird to full name her, because like...? But it sounds wrong to call her just Sarah, and Maas is so impersonal... ah?! ), I was going to tell her how great and quotable her writing was without being forced, how I love her characters, etc... But no, I did not do that. 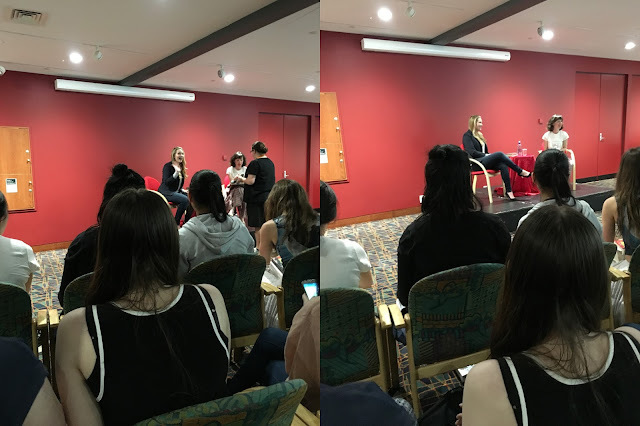 I was literally shaking like a little dog when I got up there and just about managed to thank her for coming to NZ when so few authors do. I then said "I was thinking about what I didn't want to say in the line, and I could see myself saying something stupid like "How's the weather in NY right now", even though you're not there..." and she VERY KINDLY told me how the weather was in New York in a kind of 'No question is a stupid question' type of way. I then thought I'd mention that my uncle knows Orlando Bloom's parents but would never divulge this information in case of stalking and she was like "If I saw Orlando Bloom I would just pee, and he would say "What is that urine like stain on your pants" and I wouldn't even be able to answer." to which I was laughing, and then I said "That's how I feel right now!" and she kind of looked at me, secretly pleading for me not to pee because of her presence, and said that if someone did she would want to hug them, but also wouldn't want their pee on her, so she'd probably give them a sympathetic pet on the head. She is freaking hilarious. In the below image, you'll see me literally clutching my heart because I couldn't even handle being so close to someone so talented, friendly, and genuine... Seriously though, I was fangirling hard. And then my time was up, she'd signed my books, and taken a picture with me (where my stupid purple bra strap is showing oh my god, Lauren!) and I walked away kicking myself that I didn't even tell her I loved her writing?! I am just hoping that everyone does what I didn't do so I'll stand out a bit? A girl can dream that she wasn't a complete embarrassment to her nation... Guys, I have so much regret! I messaged my friend Lauren to tell her how much I'd messed up and she replied "Aw, it couldn't have been that bad", and when I told her "We talked about peeing ourselves in front of celebrities" she couldn't stop laughing, so that's always a good sign, at least I made Lauren's day a bit better! 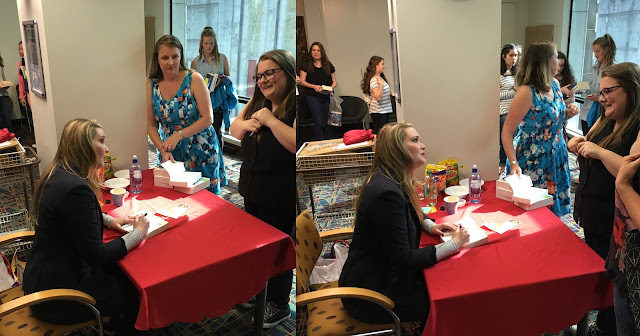 In all honestly, regardless of me going on about my burning cheeks, meeting Sarah J Maas was such an exciting opportunity. Thank you so much to Auckland Libraries for putting the event on, and even bringing the water to those of us who were waiting three hours, the fact that Sarah was able to sign for that long and that she spent at least 3 minutes with each fan was amazing. The other fans were so patient and polite, especially given the waiting time, so thanks to all of you for making that day even more magical. It will be an experience that I never forget. Oh your story was so sweet, don't be too hard on yourself it doesn't sound so bad at all! I have never met an author before, but I am going to the Sarah J Maas signing in Melbourne in a few weeks so I am really excited! I did attend an event with my book cover designer crush David Pearson, but I was too shy to go and ask him my questions after the event. Honestly it's really hard to constantly be taking compliments because it's awkward! I'm sure she was relieved to just have a chill funny conversation! I wouldn't be embarrassed at all. Every time I've met an author I shake so so hard because I'm so excited. But I didn't know what to say! Actually when I met Kiera cass I didn't say aNYTHING. I was too nervous. So that was horrible. There are worse things!! Thank you so much for your comment, you seriously made me feel so much better! I walked away thinking "Hopefully I'll be one to remember because of the weird conversation! ", so I'll keep those hopes going. I haven't read any of Kiera Cass' work, but they're on my TBR! I just met one of my favorite authors, Deeanne Gist, at a writer's conference this weekend. Like you, I was nervous about embarrassing myself and about those sad stories you hear about celebrities being less than you imagined. I'll be posting about my experience on my blog this Friday at www.KathleenDenly.com if you want to check it out. Thanks for commenting! I'll definitely check out your post. Yeah, I'm completely aware that I'm probably overreacting haha, it could have been MUCH worse and you're right, having her laugh with me was amazing. She is seriously so sweet and kind, a totally amazing person. Oh wow sweetie this is so lovely~ Seriously I love it SJM and of course TOG story because she give me an amazing story and I fall in love with each character. By the way your blog is super pretty I hope maintain in touch. And yeah the life is just that way sometimes we can say so amazing things and we finishing saying the most hilarious things on person. Your pic with her is super pretty and the purple bra If you don´t say nothing I do not even think about it. Lovely post so genuine. I love it your blog.